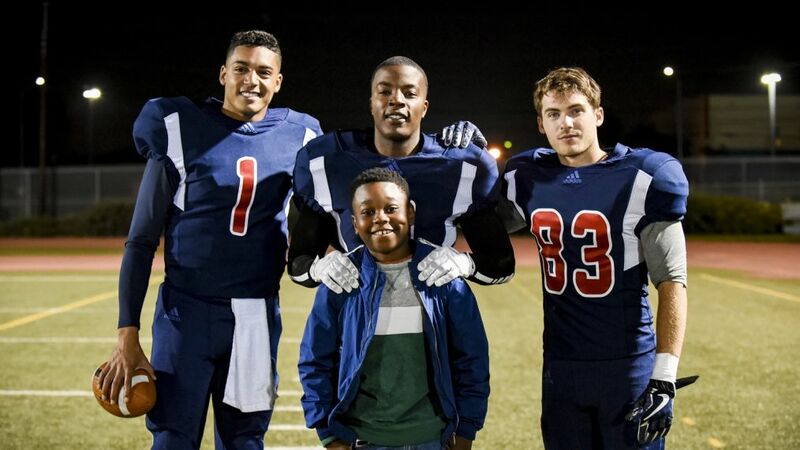 All American (9/8c, The CW): One of the fall’s more promising dramas might best be described as a mash-up of The O.C. and Friday Night Lights as it tells the story of gridiron hopeful Spencer James (Daniel Ezra) — inspired by the life journey of former NFL star Spencer Paysinger — who is recruited from the rough neighborhood of South Crenshaw to play high-school football at posh Beverly (Hills) High, where so much gaudy temptation awaits. His new coach (Taye Diggs) sees greatness in his new player, but the prideful chip on Spencer’s shoulder could be his undoing as he faces resentment from his new rich-kid teammates while being torn by allegiance to his friends and family back in the ’hood. Unlike so many of his CW brethren, Spencer is no superhero, but he’s definitely worth rooting for. A Million Little Things (10/9c, ABC): There’s no crying in hockey — unless you’re one of the bros wearing his broken heart on his jersey sleeve in ABC’s addictively tear-stained answer to This Is Us. Give the show credit for not dragging its heels. In only the third episode of the first season, a major secret is exposed, shattering the bonds among friends already rocked by the suicide of “perfect Jon” (Ron Livingston), the dude who brought and kept the group together. Jon was such a great guy, he arranged before his fatal plunge to treat his buds to Bruins fantasy camp as a birthday surprise — which ends up backfiring from the fallout of this devastating twist. Nova: Volatile Earth (9/8c, PBS, check local listings at pbs.org): In back-to-back episodes of the esteemed science series, scientists get up close and treacherously personal with two of the world’s least understood volcanoes in East Africa. In the first, “Volcano on Fire,” an international team of volcanologists climbs into the crater of Nyiragongo, an active volcano in the Democratic Republic of the Congo that has erupted twice in recent years. They deploy sensors to monitor the volcano’s activity and perhaps predict when it will erupt next. In “Volcano on the Brink,” experts get a rare peek at Nyamuragira in war-torn central Africa, taking advantage of a lull in action to fly by helicopter to the summit of the volcano to assess whether magma pressure is building up to suggest another imminent eruption. Get excited for the upcoming seasons of 'America Gods,' 'Star Trek: Discovery,' and 'Titans,' just to name a few. Inside Wednesday TV: Oscar-nominated director Paul Greengrass (United 93) explores another terrorist event in the Netflix film 22 July, a docudrama reliving Norway’s deadliest day of terror. On that day in 2011, 77 people died after a far-right extremist detonated a car bomb in Oslo and then proceeded to a mass shooting at a leadership camp for teens. The film takes the perspective of a survivor to symbolize the nation’s healing from this tragedy… The CW’s cult hit Riverdale (8/7c) opens its third season with Archie (KJ Apa) awaiting the jury’s verdict in his murder trial — the sort of thing that never happened in the benign Archie comics I grew up reading… Turner Classic Movies’ “Horror Star of the Week” is Christopher Lee, cinema’s second-most-famous Dracula, seen in all of his red-orbed glory in 1958’s Hammer classic Horror of Dracula (10/9c) and the sequel Dracula, Prince of Darkness (11:30/10:30c). Halloween in coming!